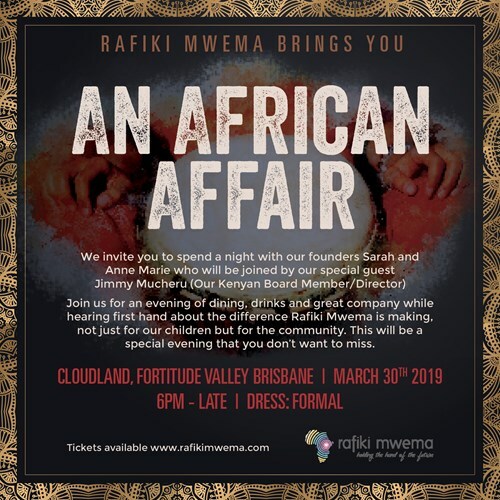 This March we invite you to spend an evening with Rafiki Mwema at our inaugural African Affair gala event. You will enjoy a delicious three course meal, drinks, dancing and some incredible entertainment by some very special guests. You'll be inspired by the, sometimes raw, stories of Rafiki Mwema founders Sarah and Anne Marie along with special guest Jimmy Mucheru, who will move you to tears with his love for his country and the importance of organisations like Rafiki Mwema. Join us for an evening of culture, insight and fun. Come alone, bring friends or get your business to grab a table of 12! Rafiki Mwema events are always a great time with great people that are guaranteed to have you leaving with a smile on your face and feeling inspired. Don't miss out. Tickets are limited, and we want to hang out with you.